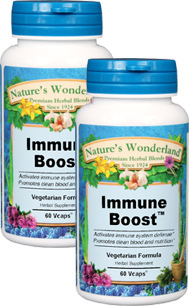 Immune Boost™ - 600 mg, 60 Vcaps™ each (Nature's Wonderland) - Penn Herb Co. Ltd. Immune Boost™ works on multiple levels to fine-tune your defenses. The precise blend flushes toxins, supports healthy kidney function, and jump-starts immune system function. And best of all, Immune Boost's cleansing action promotes clear, healthy looking skin! YELLOW DOCK…this gentle detoxifier supports the liver's cleansing action - a cornerstone for any effective herbal skincare formula. Burdock, Echinacea, Yellow Dock; Plant Cellulose (Vcaps™) - vegetarian capsules. Enhances immune system function, detoxifies; builds healthy blood; promotes clear, healthy skin. As an addition to the daily diet, take 1 or 2 capsules three times daily with water at mealtimes. CONTAINS YELLOW DOCK WHICH IS NOT RECOMMENDED FOR USE BY PERSONS WITH A HISTORY OF KIDNEY STONES.